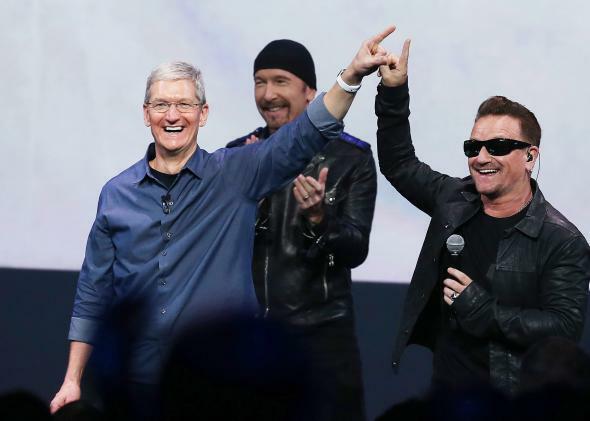 Bono, Apple creating "irresistible" new music format. Bono, Apple Creating “Irresistible” Music Format. Prepare to Buy the White Album Again. Uh-oh. Here we go again. Gee, I never lost the temptation to buy music. I admit I don’t buy as much as when I was in my 20s and playing music for a living. And I also gladly admit that I sometimes listen to “pirated” works online before deciding whether to make the actual purchase. But when I saw Time’s breathless story, I flashed back to a scene from the wonderful aliens-on-Earth comedy from the late 1990s, Men in Black. Tommy Lee Jones’ character, explaining a device confiscated from visiting aliens, says it’ll replace the CD. “Guess I’ll have to buy the White Album again,” he adds in one of the great throwaway lines in film history—a line that resonated deeply with everyone who was then over the age of, say, 30. We all knew from experience what the music industry’s game had become, in a significant way: persuade or force us to pay, again and again. Vinyl LPs, 8-track tapes, cassette tapes, CDs: Every new format had its convenience over previous ones, but we were expected to repurchase what we already owned. With tapes, we could make copies even though the music industry insisted that wasn’t proper. With CDs, we were stuck, especially when vinyl LPs were discontinued. Ditto DVDs when VCRs faded away. That’s a good business if you can get away with it. CDs didn’t sound as good as an LP on an excellent audio system, at least to many people’s ears. But they had the huge advantage of allowing easy conversion to an MP3 format that we could rip to our computers and other devices, and play to our hearts’ content without risking damage to the original. * They also fueled the first round of file-sharing (Napster, RIP.) and also launched pure panic in the Copyright Cartel. The music, film, publishing, and software industries, among others, are fine with digital distribution as long as they can devise ways to absolutely control it—and never mind the damage this does to society overall. What, then, could possibly be so “irresistibly exciting” to music fans that we’d be willing to be conned—sorry, persuaded—to buy again? Here’s what might do it for me: a digital format that recaptured the richness of vinyl sound at the highest possible fidelity. Then again, my hearing has suffered over the years, almost certainly due to the live-music days. Maybe this “irresistibly exciting” format wouldn’t make enough difference to my enfeebled ears. For many music lovers, however, it might well be a good thing. But this irresistible format also sounds like it wants to revisit an era that should be dead and buried: when music companies put DRM, or “digital rights management”—a misnomer since the expression really should be “digital restrictions management”—on the files to prevent us from playing them in any manner, or on any device, not specifically permitted by the seller. DRM is how Apple persuaded the industry to join the then-revolutionary iTunes ecosystem, but over the years, thanks in part to DRM-free competition from Amazon, this customer-controlling technology all but disappeared from our digital music files, at least the ones we could download or rip, and DVDs are still copy-protected by a system that’s been widely broken. Which is why the Copyright Cartel is moving us as fast as possible toward a world where we own absolutely nothing, not even a physical CD. They want us to be renters, period. If this irresistible format isn’t largely being designed with that in mind—based on streaming from “cloud” servers—I’ll be amazed. In their new venture, Bono and Apple—the latter has become the tech industry’s most control-freakish company—are apt partners. Amen? Really, Time? Every note anyone plays should generate money? That’ll be news to people (like me) who play in their living rooms, or at school, or in community centers, or jam sessions, or the countless other venues where so many of us play for the joy of it. And while I’m not a Catholic, when did people start paying for sacraments? Is that another 21st-century business model? *Correction, Sept. 18, 2014: This post originally misstated that CDs come with MP3 files. They don’t come with MP3 files, but the songs can be easily ripped and converted to MP3s.